This has been an exciting second half of the winter to all of us here at CodeTwo. Our developers have been coding hard to prepare some new products for you. Two new server administration tools have been already qualified for final tests and we will be launching them pretty soon. More information is to come on our blog shortly! We also continue developing our existing applications. This time, we are releasing an important update to CodeTwo Email Signatures. Starting from this version, the program can be installed in non-Active Directory based environments. This change will make the program available for a broad range users, who aren’t connected to any Windows domain, but still would like to manage email signatures for many accounts centrally. Additionally, we have simplified the program’s deployment process to make it even easier to configure and use. The update also includes some necessary changes you reported. Thank you for all your remarks and comments! For the full list of changes, please visit the version history page. The update is free of charge for all license owners. What is CodeTwo Email Signatures? 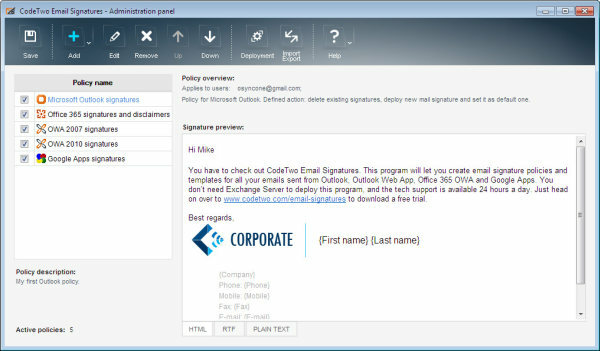 CodeTwo Email Signatures is an easy-to-use signature manager for Outlook, Office 365 and Google Apps. It allows the central management of users’ signatures and disclaimers, making sure your entire company uses a signature template that corresponds with the visual identity of your brand. Thanks to the HTML editor that comes with the program, you can compose professional signature looks, even when you’re not skilled in HTML coding. Additionally, thanks to CodeTwo Email Signatures you will be also able to control the general graphical style of messages by setting company-wide themes and fonts in Microsoft Outlook. If you would like to find out how easy it can be to deploy a unified look of email signatures in your company, download the trial of Code Two Email Signatures and test it for free up to 30 days. The program can be used with Microsoft Outlook, OWA, Office 365 and Google Apps mail. Try it now!